Michael Jordan, the best basketball player to ever walk this earth (sorry Lebron fans its true) had a vertical jump of 48 inches. The best vertical jump in the history of the NFL Combine was 46 inches, only to be toped at a regional combine with an effort of 47 inches by Willie Creear. Where am I going with all of this? You, and your 45-inch box jump doesn’t mean you can jump 45 inches and it doesn’t prove a whole lot except you have great hip flexion. What do some bad box jumps look like? Some sound like an auditioning for stomp the yard! The height of the jump isn’t the only important part of a jump, but it’s also the absorption of the force or how the athlete lands that is important. How the athlete absorbs the force can do 2 things; 1) If done well it will lessen the likelihood of an injury 2) It can put the athlete in a better position to take off or re-accelerate. Other boxes are clearly too high for the athlete. When they jump up, it looks as if someone stuffed a beach ball up their back. These types of jumps are usually accompanied with extreme hip flexion. They jump 12 inches off the floor, but because they are able to jam their hips into flexion so well, they can get another 12 inches of “height”, and are able to land on the box. With more is better and getting hurt is even better, box jumps have been mis-used in recent years. Like I previously mentioned I think box jumps can do wonderful things and help a person develop into a better athlete, however they should be avoided at times. Conditioning- The whole idea of a box jump is to teach power development and force absorption. When you become fatigued the power element can no longer be achieved, and this is when the movement becomes dangerous. Why? Let’s allow common sense to take over here. When you are tired/fatigued can you achieve maximal power? No. Now we have turned a good power development exercise into a dangerous clown trick. This is usually when we see cut shins, people falling flat on their faces, and other various injuries that may happen with a poor jump. The athlete or client clearly lacks the ability and/or understanding of how to jump. Individuals with an injury riddled past; Not saying box jumps can’t still be taught, but is there a better source of power development that you can use? Why not just use a low box and jump as high as you can? I know, jumping on a 16 inch or 20-inch box isn’t that cool. But if you jump as high as you would when you get on top of 40-inch box then who cares? The only difference here is you won’t get as many likes on instagram, and if that’s your sole motivation for doing something you are already a lost soul who needs a hug and guidance. When to implement jumps in a program? Usually I like to put them at the beginning on the workout before things like squats and deadlifts, although with deadlifts my preference would be broad jumps. Doing them at this point in the workout assures you are fresh and have the ability to be powerful. It also serves as a nice way to wake up your nervous system. Go low reps here, usually anything between 1-3 reps for 2-4 sets. 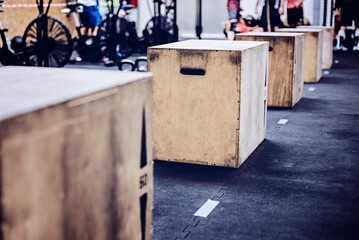 Summary: Take out the cool factor when it comes to box jumps and just do them right. For people I coach, I make sure the landing is correct before progressing to a higher box, because if you can’t land right then who cares how high you can jump. This goes back to the example of having a fast car with no breaks.